I only had one bridesmaid--my sister--for my wedding. I made her gown as well, and selected a pattern that she could wear as an evening gown after the ceremony. Her shoes, nails, and makeup all matched mine, and they're described in detail on the Bride's Ensemble page. 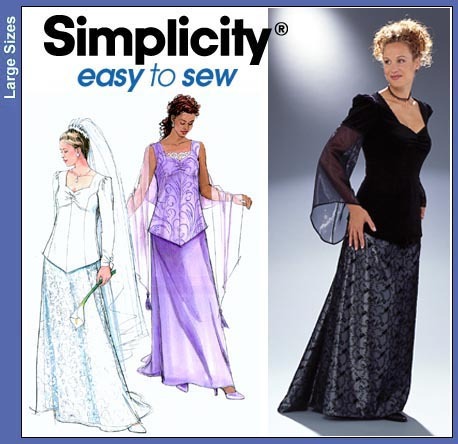 Source For the dress, I selected a black evening dress with a Gothic air (Simplicity pattern #8923). The skirt was black brocade with a slight train. The bodice was a plainer black material with translucent black sleeves similar to the ones on my dress. 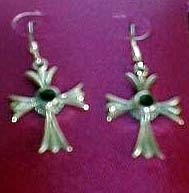 She wore black-and-silver Maltese cross earrings that I found on e-Bay. I don't recall the supplier, but a search for something like "silver maltese cross" will probably turn up something similar. 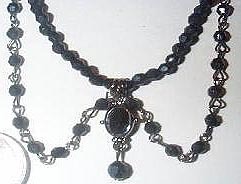 Her necklace was a black swag-type choker necklace, which I also found on e-Bay. Again, I can't recall the supplier. 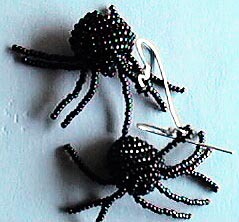 Source A friend of mine who's a talented beader made three little silver spiders brooches similar to these (the picture is earrings she made, but the pattern is the same). We let them clamber up my sister's bodice for the occasion. 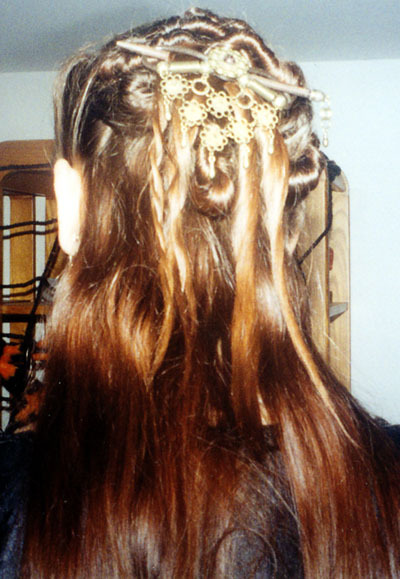 Her hair was done in a really intricate knotted structure, topped off by an ornate gothic hair clip I'd found on e-Bay. She carried a small bouquet of wheat tied with black ribbon.